Airgraphix is equipped with certified installation facilities throughout the country. A comprehensive list of locations will be available here soon. Our in house team can handle any graphics installation project you can throw at us. We travel anywhere in the country, with scalable crews that get the job done. We’re partnered with certified installers throughout the country, guys we know and trust to meet our quality standards. Full Service Installation, for anything. 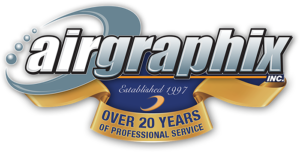 Airgraphix was a pleasure to work with from the first phone call with Wendy to working with Joe and Mike. My trucks were delivered exactly when they said with impeccable workmanship. I highly recommend their truck wrapping and lettering and as a bonus their prices are reasonable. AirGRaphix is a top not[ch group of people. They provided great solutions ans conduct themselves in a friendly professional manner. We will continue to do business with them for a long time. I’m FIRST ROUND LANDSCAPING and Joe at Airgraphix designed my logo and airbrushed it on my doors, lettered my truck and trailer back in 2004. Now in 2019 I’m on my third truck and trailer, Joe and his team at Airgraphix do the highest quality of work at a great price that comes with a warranty. Very well run business and would never consider using anyone else. First rate service. Great workmanship. Owner Joe is a really nice guy.